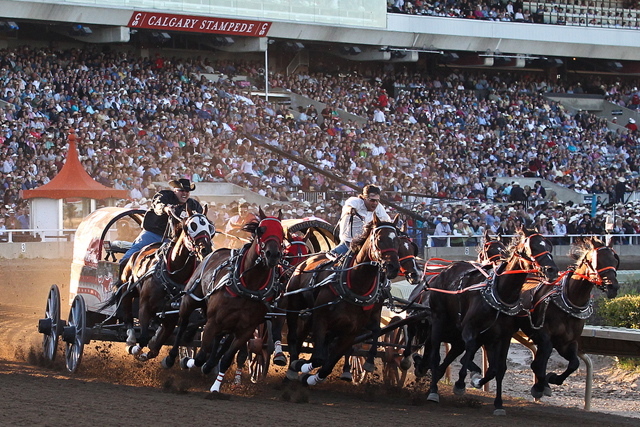 Last Saturday evening at the Calgary Stampede Chuckwagon Races, a horse was injured and had to be put down. The event has brought out those folks who are demanding that the "Chucks" - and even the rodeo events themselves - be banned from the Stampede. I totally disagree with them! I regard all animals involved with humans as working animals who need our respect and our protection. That includes every critter - from police dogs to race horses to beef cattle to Fluffy, my neighbor's cat. All of them deserve our respect! Some animal jobs are more dangerous than others. Animal safety groups have an important role in making sure all animals are working and living in an environment as safe as possible. Huge steps have been made over the years to make all manner of horse racing as safe as possible for the horses involved, but accidents do happen. I believe the Calgary Stampede is a leader in animal safety. Rules for all animal events are constantly being revised to make sure those events are as safe as possible. I've been watching rodeo and chuckwagon racing for more than sixty years and I've seen dozens of changes designed to make the event safe for the animals! Accidents will happen in any animal job. Race horses are often injured on the track, sled dogs sometimes suffer from the cold, police horses are sometimes struck by rioters! In 2003, two Calgary Police dogs died when the AC in their police car failed, and another police dog was shot by a fleeing culprit. Accidents do happen. But we need to make them as infrequent as we possibly can. Most chuckwagon horses are former racehorses, which have not performed to the liking of their owners. In many cases, their futures are limited to the chuckwagon world or the slaughter house! In my experience, I've seen chuckwagon horses well cared for and living as part of that chuckwagon family. Last evening one chuckwagon driver was really emotional while explaining to the media how he'd decided to retire an 18 year old horse in his team. The horse had pulled his wagon for 14 years and was now going to live out his life retired to the driver's farm. Not a bad life for a critter who might have ended up on someone's dinner plate (or, in dog food) years ago! To those animal safety groups, I say please continue your work making all our working animals as safe as possible, but be realistic at the same time. I think rodeo and chuckwagon racing will always be a part of the Canadian West and The Calgary Stampede, but the events will constantly be changing to make them as safe as possible.